magnesium chloride has made its home in the vast natural seabed known as the ancient Zechstein Sea. Unspoiled by the effects of man or the ravages of nature, this bounty of magnesium chloride created entirely by 100% natural processes is ready for its big reveal. But first, let us travel back to a time and place that we can only imagine. The time is somewhere between 240 and 270 million years ago and the place is our planet Earth. This far back in time, neither humans nor dinosaurs inhabited the planet. Back then, there were no historians to record the events of the day. All that we know about life so long ago has been pieced together from the evidence collected by modern-day scientists. 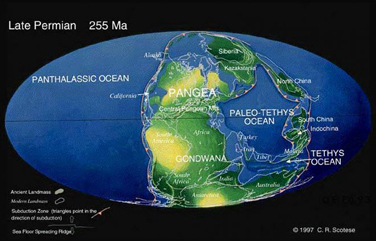 Earth as we know it today was immensely different during the Late Permian age. Rather than seven continents spread across the Earth’s surface, these pieces of land were grouped together in a single landmass called Pangaea. Stretching from the northernmost point of the planet all the way to its southernmost point, the midpoint of this giant landmass was the Earth’s equator. Far below the imaginary line that defines the Equator sat a large sea called the Zechstein Sea. Fed primarily by rivers of fresh water, the Zechstein Sea was surrounded by a much larger outer sea. Narrow strips of land separated the two seas, and it is because of these natural boundaries that there is even a story to tell. On occasion, the salty waters from the larger outer sea would spill over the land that separated the Zechstein Sea from the outer sea. When this happened, it caused the salty outer sea water to mix with the Zechstein Sea’s fresh water. Then the hot, dry air that brushed across the surface of the Zechstein Sea would continually evaporate the water. The saltwater infiltration that had taken place over the years, combined with the natural water evaporation that was constantly taking place resulted in the concentration of massive salt deposits. This infiltration/evaporation process is similar to what happens currently in the Dead Sea, but on a much larger scale. To get a better idea of the quantity of magnesium chloride created as a result of these natural forces, it’s important to put the size of the Zechstein Seabed in perspective. It’s quite large; so large, in fact that it covers an area that begins near the eastern border of present day England and stretches east to the western border of Poland. Our Earth is not a static environment. Deep inside, hot liquid magma continually transforms the Earth’s surface. This liquid was the catalyst that began the process of breaking apart Pangaea. And it’s the very same process that has triggered earthquakes and volcanoes and created new mountain ranges and oceans throughout Earth’s history. Schematic map indicating the extent of the Zechstein Sea during the Late Permian period over the topography of present day North Western Europe (dark blue = salt deposits, light blue = carbonate shelf). Over the millions of years this ancient sea has been in existence, many other mineral deformations have taken place all over our Earth. Of special note in this report are the horizontal salt beds of the Zechstein Sea. Because of their unique composition, salt behaves much differently than rock. For example, when heated to higher temperatures, salts become viscous, like honey or tar. There’s a big difference when it comes to their respective densities too, with rocks being denser than salt. Because of this, rocks tend to sink whereas salt tends to bubble upwards. Halokinesis is the name given to a salt’s tendency to bubble upwards. Over the course of millions of years, some salt beds have been almost totally dissolved by groundwater. Others have succeeded in nearly reaching the Earth’s surface. These salts have been able to make their way through cracks in the overlying rock. Some of the salt that has not been able to bubble up because of overlying rocks instead form what are called salt pillows. This is what has happened to much of the magnesium salts existing in the once active Zechstein Sea. Salt has been mined throughout most of Earth’s recorded history. As it has in older civilizations, salt continues to serve a variety of purposes. We know it mostly for its ability to add flavor to food. But, magnesium salts in various applications, have demonstrated a remarkable ability to introduce magnesium into the body through topical application – also known by medical professionals as transdermal magnesium therapy. For more in depth information, please see resources below. Times may have changed, but salt mining techniques have not. Early on, salt saturated water from the seas was boiled in an effort to separate out the salt. Technological advances such as the pick axe and the saw made it possible to mine shallow salt deposits. That gave way to massive drilling machines capable of boring deeper holes. Transportation of the mined salts is facilitated via Lorries and conveyer belts. However, although this dry technique eliminates the evaporation steps, it does nothing to remove impurities from the mined salts. Solution mining brings together the best of both worlds. This advanced technique makes it possible to reach magnesium chloride deposits hundreds and even thousands of metres below the Earth’s surface with the proper equipment. 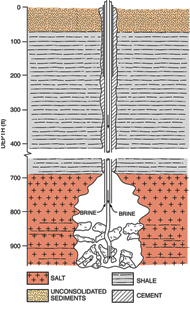 While they’re being mined, the salts from the Ancient Zechstein Seabed undergo numerous processes including water injection, pressure, dissolution, precipitation and more. The end result of all these processes is magnesium chloride, also known as Bischofite or magnesium oil, in which nearly all of the impurities including gypsum, halite, sylvite, potassium and others are naturally removed. The magnesium salts, or magnesium chloride, that’s mined from deep beneath the Zechstein Sea is far superior to other currently available magnesium salts derived from above ground contaminated water sources. It is believed by many medical professionals to be capable of restoring magnesium levels in the cells of the body through transdermal use. When cells are normalized in this way, many people report positive health benefits such as a decrease in muscle and joint pain, promotion of healthy skin tissue, improved mood, and less stress. Environmental dangers are everywhere. They’re in the foods we eat, the products that are absorbed into our skin, and the air that we breathe. With so many dangers in our everyday lives, it’s good to know you can count on nature’s bounty from the Zechstein Sea and elsewhere to offer plenty of safe, all natural relief! Currently, the only verifiable and authentic source for the above mentioned magnesium chloride drawn from the Ancient Zechstein Sea is being produced under the brand name Ancient Minerals. Ancient Minerals is available both in the United States and internationally in various formats for medical and cosmetic applications, including “ultra pure” magnesium oil, magnesium gel with aloe, and medicinal magnesium bath flakes. The Ancient Zechstein Sea is located in the Northern part of Europe, in the European Permian Basin, extending from the eastern coast of England to Northern Poland.